Workplace report for WorkersWildWest no.5 and leaflet for future distribution. Main challenge will be the migrant status of workers - there have been various police raids in the plant - and the language and contract division. Overtime (over 40 hours) gets time and a half for permanent staff and time and a quarter for agency staff under 12 weeks. The permanent workers are mainly from Gujurat in the Cumberland and Elveden factories, with more recently arrived people from Goa at Abbeydale. Like most of the bigger places around here, they use agency staff to put pressure on the permanents. The agency staff are mostly from Eastern European. Culture clash!! Communication is often difficult. And people get frustrated with each other: women on the line sometimes get annoyed when they have to teach the new agency people what to do; bad English skills means single words are shouted and people complain about bad manners; the people from India relate to each other in ways that exclude the non-Indians; some of the the assembly lines have doubled in speed over the last few years; there are more and more middle managers but also more and more disorganisation… No wonder people are stressed and take it out on each other. But it’s not all bad. It is actually pretty amazing that people from such different countries as Romania and Sri Lanka are working together. Despite the chaos and despite the fact that we may not be able to communicate so well, we still manage to work together to produce thousands and thousands of pizzas, samosas, ready-meals and houmous. And if you make a bit of extra effort to speak to people, you can have some interesting conversations. Everyone has a story in this place. We’ve all lived somewhere else. We’ve worked on ships. Many of us have sacrificed something to make a future for ourselves and our children. Some of us remember the Iron Curtain and, “the good old times when you never had to worry about being homeless or unemployed!” (Things must be in a bad state if an Eastern Block police state looks all cosy to us now!) Some of us remember our lives in India where all our family was close by and coming to England was the answer to all our dreams. But we all met here, in this company that rewards its staff not by paying us a decent wage but by giving us a goody bag of teabags and biscuits! Before the government raised the minimum wage this year (to £7.20), permanent workers were earning 9 pence more than the previous minimum wage (£6.79). There is a large union membership inside the company (GMB) and people pay £13 a month. They might get some help with individual grievances and disciplinaries but in terms of health and safety, pay and general atmosphere, we haven’t really got our money’s worth. When the new minimum wage was introduced, suddenly the company found the extra money. Many workers think the company is doing badly. They lost the Tesco mash contract early in 2016 and previous Christmas periods seemed to be busier. But this does not mean they are doing badly overall. They are hiring hundreds of workers in other parts of the country and their revenue is increasing every year. In the first half of December 2016 a notice went up on the GMB noticeboards in the various factories, saying that the 2017 pay claim would be in line with the London Living Wage. After years of below inflation pay increases they wrote about how the increasing pressure on workers was no longer acceptable. This is fighting talk - and about time! But what we can be sure about is that Bakkavor won’t pay us more unless the whole workforce comes together and takes action. The question is, how much will the union really put up a fight? They may be able to bring out the permanent workers on strike but the agency workers, who are not in the union, will probably not be included. But this will be necessary if we don’t just want agency workers to take the extra shifts and undermine a strike. And how much will us workers feel that we are part of the decision-making process and have some control over what action we take and the outcome? If we really want to change things around here, we need to try and take some responsibility ourselves and not leave this all in the hands of the union reps and negotiators. In the last year, some workers were told that they had to change their shift pattern. They wanted people working 4-days on, 3-days off. This is the cheapest way to have the factory running for 24 hours because it means you only need 2 shifts instead of 3. People working weekdays were told they had to work weekends instead and some people had to move over to night shift. Women with kids had problems with childcare and many went to HR to complain. But they were told that if they didn’t like it, they could leave. Some workers did leave. But then, some agency workers came and got weekday shifts so it seems the company puts the permanent workers’ needs last. It doesn’t matter if you work here 1 year or 10 years – there is no such thing as ‘job security’. Then there is the issue of overtime. Working overtime after a regular ten-hour shift like we have to do at Cumberland and Abbeydale is HARD. But lots of us agree to work the overtime because we need the extra money. But the company wants to make our regular shifts longer so they don’t have to pay as much in overtime. Once they make our shifts 10 hours long, and we do 2 hours extra overtime, what is to say that in a couple of years, they ask us to do 12-hour shifts as standard? Lots of people who were given 3-month contracts with Bakkavor from August this year have been having ongoing wage payment problems. One guy who had been working there for 6 weeks was owed £1000! He left the job in disgust when he finally got his money, after hassling HR and contacting the GMB. But another young woman was just going to quit and was not going to fight for her money- probably because she didn’t know how and her English was not so good. Lots of people were affected by this, and when we are being paid weekly, we cannot afford these f**k ups! People have their individual disputes with HR but it would have been a good opportunity to go as a bigger group, or at least get together to discuss a plan of action. The higher up managers set the tone and the ones at Cumberland and Abbeydale in particular are notoriously mental. One made a woman cry on her last day of work. And he made an older agency woman cry on her first day for wearing the wrong colour mob cap - when she hadn’t even started her shift yet! He obviously ate his weetabix that morning. Humiliating people is a special talent and these two should win a prize. If this is the behaviour of the operational managers, it sets the tone for all the red caps underneath them. The turnover of agency staff is high. After a while, or even after one shift, people leave. Some of them can’t stand the smell. Some of them get dizzy because the line is too fast. Some of them can’t stand lifting the back-breaking trays for hours and hours. Some can’t bear the constant shouting or loud noise of the houmous machines. People complain of not being treated with respect. There are lots of small fights with managers. The agency offer time-and-a-quarter for overtime (over 40 hours) if you have worked there for under 12 weeks. After 12 weeks, they get same as permanents (time and a half). But often, the agency try and get out of paying this overtime rate by sending you to a different site from where you usually work. They say this is a ‘different workplace’ so does not count for the overtime payment. But if you are doing the same type of work for the same company, just in a different location, legally, this means you should still get the overtime rate. In December 2016, a notice went up that two Bakkavor employees at the Elveden factory were arrested and detained by the Home Office because they had fake passports. They had worked at the company for a long time. It is always difficult to find out exactly what happened in these kind of situations, but rumour has it that this was not a totally unexpected visit (in other words, Bakkavor knew the immigration were coming), and that the company had to pay a £40,000 fine. Sometimes, companies work with the immigration people to trap their own workers in order to avoid a fine. This is what happened in the case of Byron Burgers ([see p.??]). Rumours were that Bakkvor were fined though - £20,000 per ‘illegal’ worker. The Home Office could have gone to these workers’ homes but instead, they came to their workplace. This seems to indicate that Bakkavor were involved in the visit. Fear spreads amongst all workers, which is good for the management because it means their workforce are more likely to accept the current pay and conditions and not be too demanding. This incident happened around the same time that the GMB announced that they would try to win a big pay rise for Bakkavor employees in 2017 – so that our pay is more in line with the London Living Wage which is almost £10 an hour. In this context, fears around immigration can work to the company’s benefit to keep people quiet and less likely to risk going on strike for example. Ever noticed how it’s mainly the men who are still in the canteen at 2 minutes to start of shift? And it’s mainly us men who are wandering around the factory? We might have to do more physical work but we also get to escape the red cap’s attention for some parts of the day. Impossible if you are a woman! They are chained to the line, every toilet break is monitored, you can’t slip back a bit late from break because they notice. You can’t even talk to each other too much when you are doing the most boring and repetitive jobs – lots of women are moved if a red cap sees you talking too much. Is this a prison or what?! But why are certain jobs only done by men? Women can stack a pallet just as easy as a man. It might take two women to carry a pallet but they can do it. Women can also use a pallet truck. Women can lift the pastry trays and strong women can even do the lasagna trays. Men can go on the line and put sleeves on containers. Or glue on the pastry. But when someone tries to do a ‘man’s job’ or a ‘woman’s job”, they are shouted at or undermined by the other workers. It’s understandable that people don’t want to do ‘more jobs’ but men shouldn’t automatically be put to heavier jobs because what about if the man is old or has a bad back? Jobs should be done according to our abilities, not whether we are a man or a woman. After 2 hours of doing ANY job, our muscles start to hurt and our backs start to ache – regardless of whether we are a man or a woman. The point is we should all be rotating jobs so we all get some breaks and less chance of injuries. Many of us are with GMB at Bakkavor. Lots of us have left because they are not making things better around here. Why pay £13 a month to receive the minimum wage?! They might help us individually but it is difficult to see how they are making our work life better. If we have to rely on overtime to make some money, something is very wrong! Other unions are no different, as the 2 Sisters example shows. We will have to rely on ourselves and each other. We need to think about what we can do to put pressure on the bosses to give us better pay and conditions, but that will not make us stand out individually. We can see where we are strong or can make an impact without doing anything that we could be individually victimised for. But firstly, we have to stop being grateful for this job. We have to stop thinking that we are too old, that we don’t deserve more because we don’t speak good English. That we are ‘unskilled’. Our collective strength is what is important, not whether we can speak English or have a degree. This work is hard. They send us crazy. It won’t be better in the next job around the corner, or for our children in the future. We have to make things better for ourselves now! SEF’s (Staff and Employee Forums) are managers talking shops. And we all know the union is close to management. But we need some way of linking up with other Bakkavor workers (in our own and other factories) and discussing our problems and possible actions. It is up to the union to support OUR decisions, not for us to just do what the union tell us. Perhaps a few of us can organise a meeting outside work and ask other workers in different factories to come? This is also a good way for workers to share their experiences. Some of us have worked here a very long time and could teach newer workers a few things. For example, a lot of the staff at Abbeydale are newer to the UK and have only worked there for 2 or 3 years. So they could learn something from the old-timers in other factories who have more experiences and know what working in this company used to be like when it was owned by Katsouris. For example, when Abbeydale was burnt to the ground in a fire in 2009, they wanted us to use up our annual leave while the factory was closed. But we said no, the fire was not our fault, why should we sacrifice our holidays? So we were paid even though we did not have to do any work. Stories like this should be shared across the factories so that more recent workers know that we did stuff in the past and things were better in some ways as a result. Overtime is one thing we could sacrifice to put pressure on the company. And they would not be able to punish us for it because it is optional. Health and safety and hygiene are also two areas we can use to our advantage, especially because we are working with food. They keep pestering us about health and safety and cleanliness, while also wanting us to work faster and faster. We have all seen how they slow everything down and tell us to do things "properly" when the auditors are snooping around, but when they are not there, they tell us to work so fast we have to ignore their own rules. Why not threaten to slow down and follow the rules all time? After all, we would only be doing our job safely, according to the bosses’ own rules. 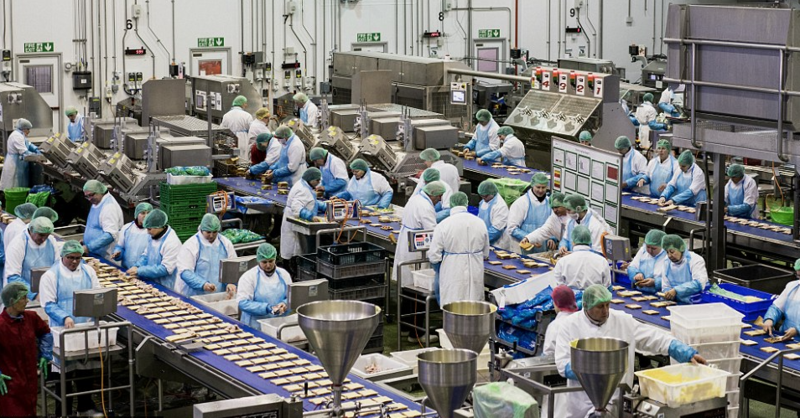 Assembly line work can be repetitive and loads of people complain about muscle strain and aching legs and feet because we have to stand up for hours and hours and cannot sit down. The Workplace (Health and Safety) Regulations 1992 refer to standing. The law says that employers must supply suitable seats if workers are able to perform their duties, or a substantial part of them, sitting down. They can be served with improvement notices to supply chairs for the assembly line for example. This could be something we ask for, especially for the older people. Some of the machines are very noisy. Over time, lots of us have gone a little deaf! But we do not have access to earplugs inside the factory if we want them in the middle of a shift. Sometimes they even run out of earplugs. There are notices up about the Noise Regulations Act but it makes no difference if we, as a workforce, have little power to enforce these rules. Permanents and agency workers need to stand up for each other. If they are allowed to bully the agency workers into working harder, they can use that to make all of us work harder and it becomes the new normal. LONDON LIVING WAGE INCREASES TO £9.75! So why are we at Bakkavor still NOT getting the minimum wage?! Aldi supermarket workers get it. Temp road sweepers in East London have it. And groups of cleaners in central London have gone on strike to get it. It wasn’t easy, but by fighting together, they won. If supermarket workers, street sweepers and cleaners are getting this money, we should be able to get it too. We may get time-and-a-half for overtime but why should we have to work overtime to make enough to live well and save for the future? 40 hours is already too much time! STOP BULLYING AND SHOUTING AT US – WE ARE AT WORK, NOT WAR! – OR ARE WE?! Bakkavor talks about respecting their workforce. But there is little dignity and respect here. At the beginning of this year, management told some workers they have to change their shift from weekdays to weekends or to night shift. They said ‘change or leave’. Is this the behavior of a company that respects its workers? The red caps shout and bully us. For a few extra pence they accept to become management’s little agents: “Faster ladies!”, “Why line stop? !”, “Too much talking!” And they keep increasing the line speed. The speed of the lasagna line at Elveden has doubled in 3 years. The samosa ladies’ hands fly faster and faster to keep up. But a lot of the stuff ends up in the bin because the quality is bad. Our feet, back, neck, shoulders, knees and hands ache after a long day. But what do they care? We can bury our heads in the sand and say ‘nothing will change’. Or we can start supporting each other more and find ways to have more breathing space at work. To think and talk about how to get what we deserve and refuse to be treated bad. Nobody wants to lose their job. But that just means we have to be careful. The first step is to meet up and discuss our options: Will the union help us? Can we put pressure on the company in other ways, without relying on the union, and without leaders who the management can target? Is there more creative stuff we can do that isn’t just about going on strike and is about building our strength on the factory floor? For example, what if we all actually stuck to the health and safety rules to slow the pace of work down?? We want to have a meeting outside of work. If you are just one person or a group of friends, contact us at: angryworkersworld@gmail.com and we can organize a time and date to suit you. Otherwise we will be outside the factory again on ___ at ____. Talk to us and tell us if you are interested in discussing things further. Permanent, agency and contract workers, day and night shift, women and men all welcome! We are a group of workers who want to do something together to improve our situation in west London factories and warehouses. We are independent from political parties and unions. But it’s not all bad. It is actually pretty amazing that people from such different countries as Romania and Sri Lanka are working together. We still manage to work together to produce thousands and thousands of pizzas, samosas, ready-meals and houmous. hope you all good and discontent! we got some things planned for the near future and hope that we can work on it together. If you live in London or close by, feel welcome to stay over for a night or two and get involved in the following. If you live further away, we might come and visit you – read on! We designed some new posters for weekly drop-ins at the local McDonalds drive-in, in the Park Royal Asda cafe and a tea place in Southall. If you up for a stroll and good with sticky tape, pop by! We have been working in these factories for a while now and want to try to organise a meeting of interested workers. The company runs three factories and an industrial warehouse in the area, so it is a bit of a logistical challenge. We thought it would be good to have a stall and some music during distribution. Even if you are more of a home-cooked kinda guy, feel free to join in! Any help with Gujarati, Tamil or Goan translation welcome! We would like to meet up with people who we share common hopes with (workers’ self-emancipation from capital, state and oppression) and who want to establish solidarity networks and regularly circulate newspapers or other publications amongst the local working class. We want to discuss practical experiences and challenges of this type of political work. We want to debate revolutionary strategy: how to learn from workers’ experiences and how to relate them to our positions on internationalism and the struggle against the system as a whole? How can we get more rooted locally and at the same time discuss our experiences and positions with folks who do similar work elsewhere? If you are up for discussing this, we will come and visit you!